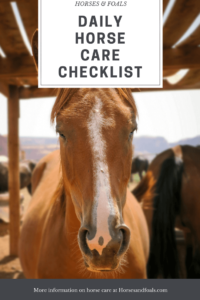 Caring for a horse is a big responsibility, and to do it right there are specific tasks you must perform every day. These tasks don’t have to take a long time, but they must be done consistently. One way to make sure you get everything done is to make a complete list of all of your equine responsibilities and then create a schedule according to which things must be done every day, once a week, once a month and periodically. In this article we list some of the most common tasks horse owners perform. We provide handy checklists and guidelines that will help you get everything done. Read on to learn more. Here are the tasks you must attend to every day. 1. Any grain you feed should be delivered in a couple of small meals daily rather than one large one. Feed forage such as hay or beet pulp in a couple of small meals daily as well. Alternately, leave a supply of hay in net hay bags so that your horse can nibble on his own throughout the day. 2. Be sure your horse has clean water. Fill water troughs daily by allowing the water to run over a bit to displace stale water. Be certain your horse has access to at least 10 gallons of fresh water at all times. More is better. 3. Remove manure and wet straw, shavings or other bedding from the stall and paddock area. 4. Give your horse a light grooming or at least run your hands over him to check for any injuries or sensitivity. Lift all his hooves and pick them out to be sure the hooves have not been injured and to prevent stone bruises caused by pebbles that may have become lodged in place. 4. If your horse is kept in a small stall, corral or paddock, turn him out, ride or lunge him for at least half an hour a day. This is the minimum requirement for exercise. 5. Damaged structures can cause injury and may result in escapes. Keep a sharp eye out for damage to fences, gates and stall mats. Repair or replaced damaged structures and items promptly as needed. 6. 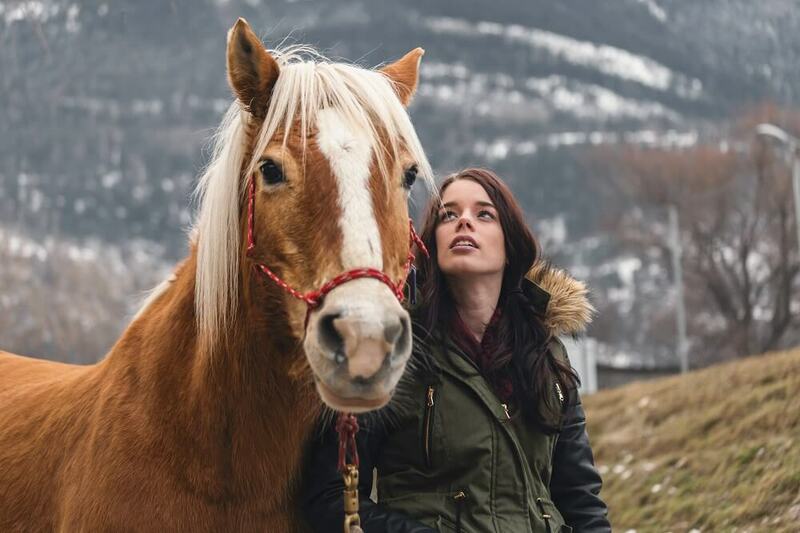 Spend time with your horse. 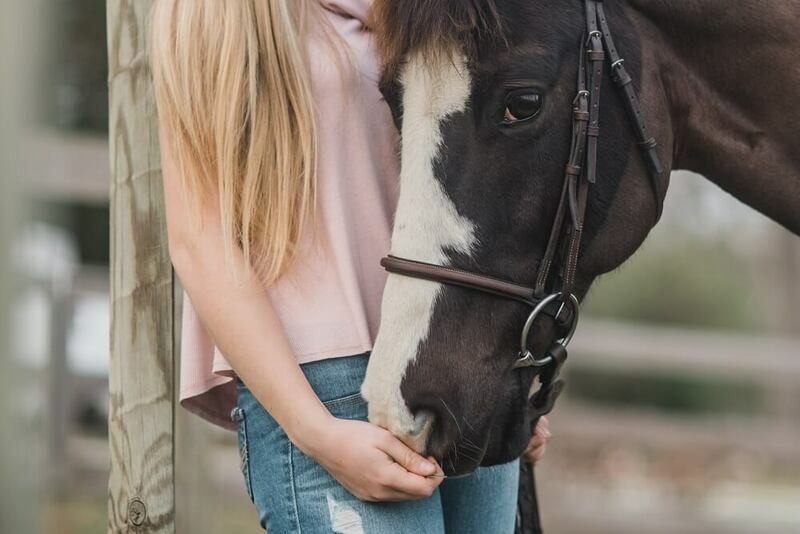 Take a little time to pet your horse, talk with him and give him treats. Remember that your horse is a companion and relationship building is a very important part of your interaction with him. When you spend time together, you will become good friends and that will make your rides and other activities much more enjoyable. In addition to daily tasks, there are things you must do about once a week. 1. Take a long ride or otherwise work with your horse for an extended period of time. This helps alleviate boredom, releases pent-up energy and encourages good health. 2. Perform a thorough grooming of mane and tail, body and hooves. Apply any hoof dressing and perform any trimming necessary at this time. 3. Empty, scrub and refill buckets, automatic waterers and/or troughs. 4. Turn your manure pile, add diatomaceous earth and cover it with dry leaves or straw to prevent fly problems. 1. If you show your horse you may want to bathe or clip him in preparation for shows. Otherwise, these are optional activities. For a pet or pleasure animal, a summertime bath may be a good way to cool off, but if your horse hates it, don’t force it. Don’t bathe your horse in the winter, and remember that he has a winter coat for a reason. If you don’t need it clipped for showing, leave it in place for warmth. 2. Schedule regular checkups with your veterinarian and be sure to keep all vaccinations up to date. 4. Apply fly repellent products as needed. Some fly sprays for horses are intended to be used daily. Some spot-on products are intended to be applied monthly. Be sure to keep a good arsenal of fly repellent products on hand and use them according to packaging instructions. 5. Set up a recurring appointment with your farrier to check and trim your horse’s hooves once every two months. 6. Work with your veterinarian and your farrier to set up a schedule of dental care. Your vet should check your horse’s teeth at every exam. If the teeth need to be floated, your vet may perform this task or, in some cases, a good farrier can take care of it. 7. Take care of your tack and equipment. You will need to clean and oil your leather goods and keep saddle pads, blankets and rugs washed and properly mended. Clean and replace grooming equipment on a regular, ongoing basis. 8. Power wash the interior of your barn and stalls on a seasonal basis to prevent fly infestation and reduce problems with dust. 9. From time to time, you can also clip your horse using the best horse body clippers. Is Horse Care For You? If you keep your horse on your property, you may find horse care a bit overwhelming. You cannot neglect tasks such as stall and paddock cleaning without suffering the natural consequences of flies, disarray, odors and unsanitary conditions. This is why many people choose to keep their horses in a stable setting where the maintenance tasks are done for them. That’s great if you can afford it. If not, you are wise to establish a regular schedule of care and maintenance and stick to it. Most horse owners enjoy the time they spend caring for their horses. Time in the barn is time away from the daily grind of life. If you can turn off your cell phone and focus on your equine friend, you will surely find this to be a relaxing and therapeutic time. I have recently started volunteering with horses at the DSPCA in Dublin, Ireland. At the moment, I am learning the basic knowledge to understand about horses, while volunteering with the equine. What would you advise me,how to make a Equine daily checklist to take care of horses/equines at the Animal Sanctuary. Thank you for your question! Congratulations on your good work with the DSPCA. I’m sure you will learn a great deal while you do good for animals in need. In your situation, I think it would be a good idea to begin each day by simply touring the facility to see how everyone is doing, what new animals may have been added and what may need to be done in the course of your shift. This may mean coming a few minutes early, but the knowledge you’ll gain will help you organize your day efficiently and meet the needs of the animals in your care. As an added benefit, making an extra round at the beginning of your shift gives the animals more opportunity for interaction with you. Otherwise, loosely follow the steps I’ve described here. Naturally, you may need to change the order of things to accommodate your setting, but generally just make sure everyone has clean conditions, feed, hay and water, grooming and lots of positive attention.